In my Bag, Minimal Travel Makeup - Hej Doll | Simple modern living by Jessica Doll. For my recent trip to Paris I thought I’d do something different when it comes to my travel makeup. Inspired by what I’ve read about French beauty, I packed only 5 products for our trip. The French approach makeup with a less is more outlook, and I have to say it was quite refreshing to spend a minimal amount of time packing and applying makeup. My skin is thanking me for it, and I’ve continued this routine at home too. Maybe less really is more? After my normal cleansing and moisturizing routine, I apply this concealer in the color light to my eye area and the center of my face. I blend outward with my Beauty Blender Pro Makeup Sponge. This is the only eyebrow pencil I’ve found in a blonde-enough shade that does not look red or orange on my skin. The color is called lingering. I lightly trace over and shape my eyebrows with it. I’ve never been a huge fan of rosy cheeks, so I stick to this matte blush in the color blunt. I apply it very lightly with my #16 Dior Blush Brush to help give more shape to my face around my cheekbones, nose, forehead, and jawline. After curling with my Japonesque power curl eyelash curler, I apply this mascara in the color graphite liberally to my top lashes, sweeping outward and upward and rotating the brush with each stroke. I add a little to my bottom lashes for balance. I’ve been using this all natural coco rose lip conditioner for years now, and it’s still at the top of my list. It goes everywhere with me and I apply it often. 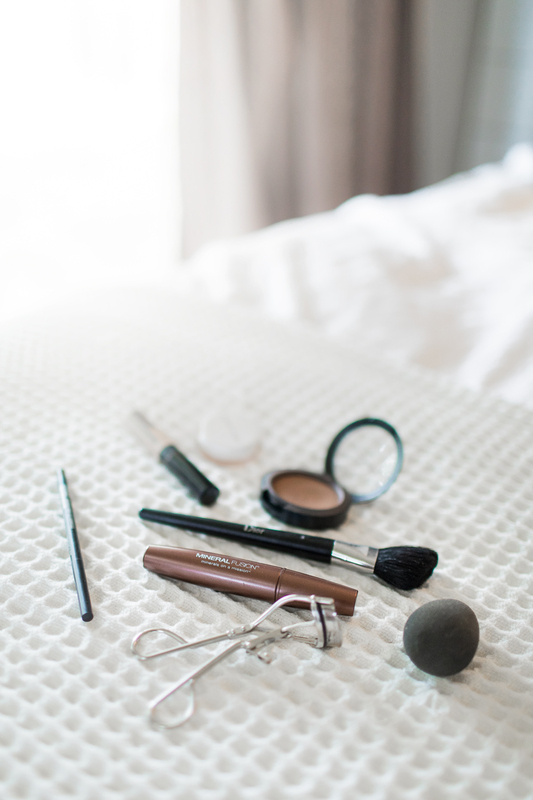 Do you tone down your makeup for travel? Or do you pack the same as you wear everyday? Ahhh, sounds wonderful! I’d die without my mascara though, half of my eyelashes are so light-colored that I look like I don’t have any, haha. That’s such a great idea for travelling, and as you said, great for your skin, too. I always find that I end up packing my entire makeup collection for when I travel — “just in case” — and not only do I not use half of it, but I find it’s more than I would need on a normal day! I think I may try your idea on my next trip (hopefully to Paris.. easier for me coming from London). I love Herbivore but have yet to try their lip balm; I think that will be my next beauty purchase. Thanks so much for the great tips! This is such a great idea for travelling!! I always find that I bring way too much makeup that I never end up using. Packing only 5 items sounds like a great way to lighten my load! Oh gosh! I really need to get better about packing minimal. I think I’ll start with the makeup since I cant even bare to think about packing less outfits.